Anyways, above, I've featured some fun things for both boys and girls of all ages. I do want to mention that just because I added some things into the "boys" category, that doesn't mean that a girl wouldn't love them as well, and vice versa. For example, Madeline has always loved dinosaurs! And I actually ordered the Aqua Markers Flashcard set for her basket. 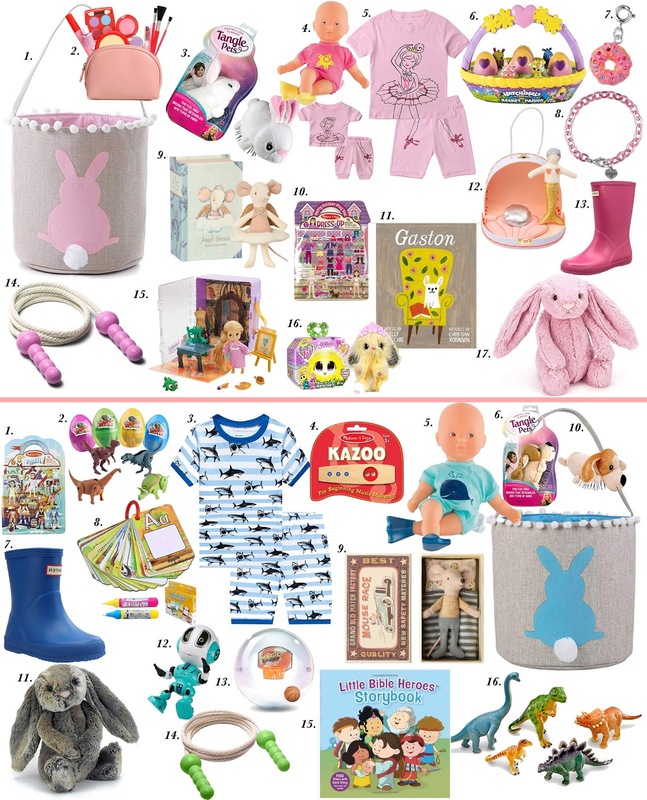 I also want to add that I was able to find 90% of the things I wanted to feature on Prime, so there's still time to order and receive in time for Easter. Madeline LOVES Maileg Mice! She has a little collection started and is getting one in her basket on Sunday. Above, I included the angel mouse for the girls and the little brother mouse for the boys. They're just the cutest things! I also included our favorite Bible Story book and the story of Gaston which she just loves! It's the cutest book. She has memorized the entire thing! And if you don't have a Tangle Pet for your little one, you're missing out! It's the only way I can brush Madeline's hair sometimes, and it gets tangles out like magic. She has the dog one and named him "Little Little" haha. These dress up sticker books and also great for traveling! I hope y'all found this post helpful and some inspiration for finishing up your baskets! I'd love to hear about what you included in your baskets this year. Now for a little on our looks! Like I said, I can search for pretty much anything on Walmart and find what I'm looking for! For example, I typed "Gingham Top" into the search bar on their site and found this adorable blue and white gingham tie-front top! Y'all it's just the cutest thing and is only $13. It feels so much more expensive than that! I love how the back is solid ivory, and the gingham print follows all the way around the neck-line (even to the back) and outlines that little button key-whole in the back. The details are pretty much perfection for this top. It also comes with the cutest tassel necklace. I decide not to wear it in this post, as I opted for yellow accessories, but I will definitely be wearing it with other pieces. My sandals are one of my tried and true, favorite brands that has created a line named "Circus" especially for Walmart. The quality of the shoes is just as amazing, but the price is so much less! I love having a lemon yellow pair for spring and summer. These run TTS and are under $40! I know I'll get a lot of use out of them. They're also very comfortable and have a cushioned footbed. I also have this pink pair by the same brand that I just love as well! And the last piece I want to mention is this cognac circular bag. I also have it in pink and have gotten so many compliments on it! When I tell people it's from Walmart and only $14, they're always shocked! It comes in several prints and colors. Also, there's nothing sweeter than a little girl in a pair of shortalls, if you ask me :) I love that I can find amazing pieces for Madeline at Walmart as well. Her little shortalls are only $12. They come in several colors, including pink! They also have the cutest little touch of bling to the buckles. I know that I featured this same collage in my last Walmart post, but I thought I'd share it again because these are some of my favorite finds from Walmart. This eyelet, ruffle back top is one of my very favorites and is absolutely adorable! First up is some Easter outfit inspiration for the entire family. I put together both a seersucker and a gingham look. This seersucker dress for both women and girls comes in blue and pink! Tie the looks together with the guys by adding in a seersucker blazer for the boys and a tie for the men. And I'm more than obsessed with these gingham mommy and me dresses! I actually just ordered them for me and Madeline! They're super affordable as well :) Gingham is another really fun Easter option for the entire family and is easy to work with. 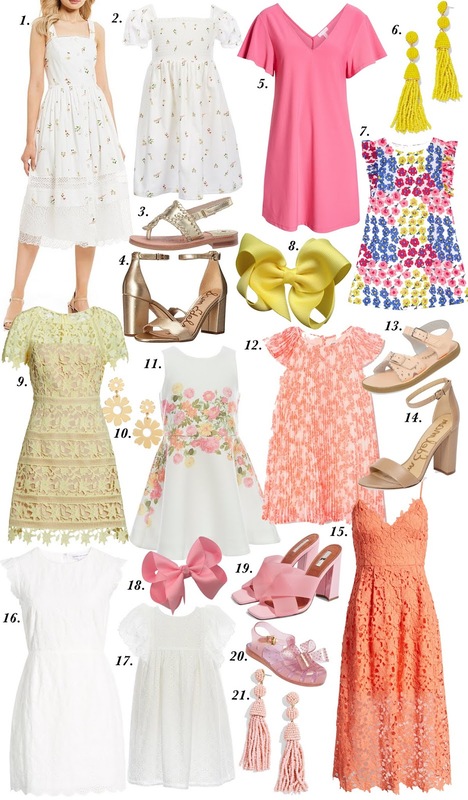 Next up is some Easter dress inspiration! If you're a mama, I also included in some dresses for your little girl, if you're planning to match or coordinate with her. I love all of these! Numbers 1 and 2 are a perfect match for a mommy and me look. I also love the idea of you wearing a solid and your little one wearing a print. Add in some colorful accessories to tie the looks together. There are so many possibilities with these pieces. I also added in some great accessories to go with the looks. I hope y'all found this helpful! Do you have your Easter dress picked out yet? Hi friends and happy Friday!! A few weeks ago, we took a girls trip to Charleston, SC. When it was time to leave, Madeline was sad and said she wanted to stay. I felt the same. Our girls trip to Charleston is something we do each year. That being said, each time we visit, Madeline is a little older, and there's that sad feeling of knowing it will most likely be a whole year before we visit again. We always love our time there, each other's company, the amazing food, the gorgeous scenery, etc. And there's just something about seeing all of that in March. Well, this year on our way back home, I had a little surprise for Madeline. I wanted to stop by Sullivan's Island (a little less than a thirty minute drive over the bridge), just to let her run around on the beach for a few. When I told her we were stopping by to say hi to the beach, her excitement level shot through the roof haha. My girl has a huge heart for the beach, just like her Mama. And some of the sweetest moments are seeing her soak it all in. Honestly, there's nothing sweeter than seeing your little one enjoy the majestic designs of our amazing Creator. And my heart feels at peace in these moments as well. I guess you could say, it's our happy place :) Goodness, I can't wait until our beach trip this summer! Also, it was SO incredibly windy that day. Now for a little on our swim looks. I found these amazing (and super affordable) blue and white swim looks for both me and Madeline and thought it would be fun to share some photos of them while we stopped at Sullivan's Island. I can't say enough good things about them! I simply adore this ruffle swim top! It has a little lace up detail, and the tiny scallop sea shell charms make it perfection! It's under $20! I went up one size to a 2, just to have a little more coverage. It has removal pads as well. I decided to pair it with these same blue and white stripe high waist swim bottoms. I LOVE the lace up details on the sides as well. Again, they're under $20. There's also a one piece version of this swimsuit. But I think my favorite of all is this kaftan!!!! Y'all, it's simply GORGEOUS!!!! And under $30. I love how dramatic in looks blowing in the wind on the beach haha. It also looks super cute paired with some jean shorts and a white tee underneath for an everyday look. This same print also comes in a sarong. And I also found a matching swimsuit for Madeline, again under $20. This exact style has sold out, but shortly after I got her this one, they got in an even better blue and white stripe match to mine that has eyelet details and is SO cute. I also adore the little butterfly charm on this one. If you're looking for some cute swimsuits for spring and summer, I hope this post helped y'all out! H&M is quickly becoming one of my favorite stores to shop at. I have found SO many cute pieces for both myself and Madeline. 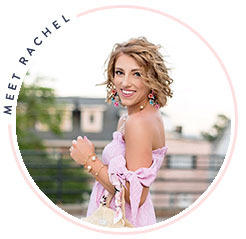 And their swimsuit collection is pretty amazing for both women and kids :) Also, I just saw that now through Monday, they're doing 20% off all kids clothing purchases of $60 or more! Seriously there are so many good things for the little ones. Thanks for stopping by! I hope y'all have the best weekend. Since the sale ends tomorrow, I thought it would be fun to share a few of my very favorite items I already own, that are included in the sale. And since I purchased several pieces of clothing and some new sandals, I figured I'd share my purchases as well. As for my favorites, these wedges, which were a HUGE hit last year and again thing year, are included in the sale. I wear them all the time and love them so much! They run TTS. 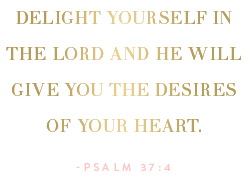 My favorite Karen Walker sunglasses are also included in the sale. The frame shape of these is so flattering. They're my favorite pair for three years in a row now! The Clare V. Mini Alice bag (also a favorite of mine) is included in the sale. My favorite pair of pink sandals are on sale. They're the best shade of pink and are the perfect shade to pair with Lilly. And last but certainly not least, these scallop sandals are also included. Now for a few things I purchased. First up, I got these amazing Tory Burch Millers. I've never owned a white pair before and LOVE the gold hardware on these. This sandal rarely ever goes on sale, especially this time of year, so I was so excited to get them discounted. I also purchased two dresses. I love the details and silhouette of this wrap dress. I think it will be so cute paired with pink accessories. I also grabbed this adorable green polka dot one. I love kelly green but don't have very much of it. 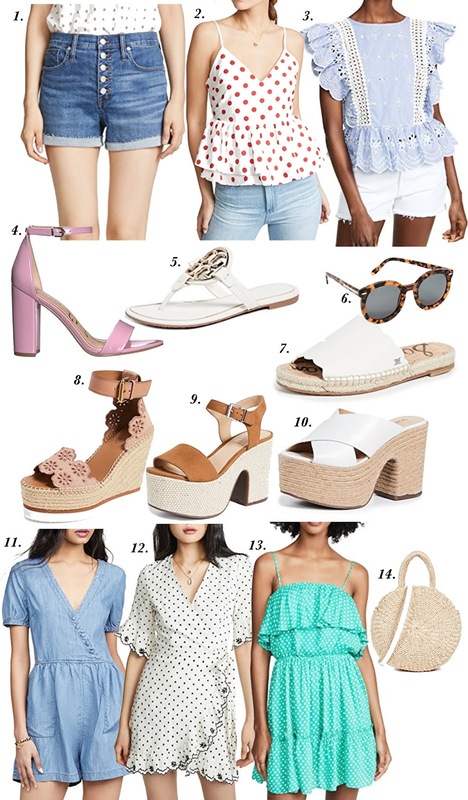 I think it'll be perfect for our upcoming beach trip and will look adorable with a white denim jacket! Both of these are under $100. I also purchased two new tops. How precious is this one?! I love the red polka dots, the style and the back tie detail is amazing! I'm so excited for this one. I also picked up this adorable one! 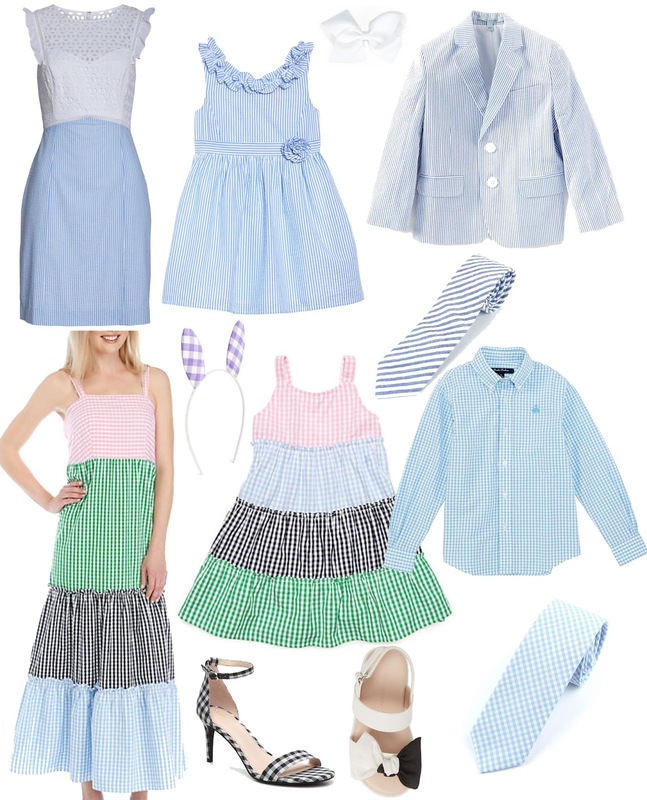 I love the blue and white stripes, the ruffles and eyelet details. Absolute perfection, if you ask me :) Both of these are under $100 as well. And lastly, I purchased two denim pieces. First off are these high waist denim shorts. I had been wanting some button front ones, and love these! This brand usually fits me very well also. I sized up to a 26 for these, as I feel jean shorts always run small. They're affordable as well! And I'm SO very excited for this romper! The sleeves, the little buttons, the wrap style...so much to love about this piece! I know I'll get a lot of wear out of this one. You could easily dress it up or down. Well, that's about it for my sale purchases and picks! If you picked up anything from the sale, I'd love to hear about it. Mommy & Me Lilly Pulitzer With Palm Village Augusta + Giveaway!! Happy Wednesday, friends!! 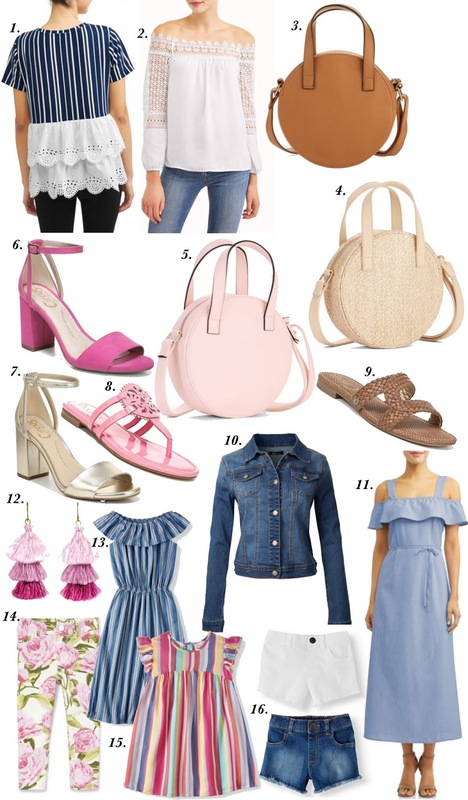 I hope y'all are having an amazing week so far :) I'm so so SO excited for today's post, because it involves several things I just love: A mommy and me look, Lilly Pulitzer, my favorite local shop Palm Village Augusta, and a giveaway in honor of the most exciting week of the week here in Augusta! I've teamed up with Palm Village Augusta today to bring y'all a fun mommy and me Lilly look in honor of the Masters Golf Tournament. Whether you're a golf fan or just love Lilly, like we do, we want to bring y'all in on the excitement today. I'm also so excited about our Lilly looks. And y'all know I just love a good mommy and me look, even more so when it's Lilly Pulitzer! The girl's little Lilly Classic Shift in multi cheek to cheek is the perfect match. This is my favorite style little Lilly Dress of all! I grew up wearing this style dress, so seeing it on Madeline now makes me so happy. As I mentioned, both of our Lilly looks are from Palm Village Augusta. And in honor of the Masters Golf Tournament, we are teaming up for a fun giveaway! Be sure to head over to my Instagram, around 8PM EST tonight to join in on the fun :) Palm Village has pretty much every every Lilly piece. You do not have to be local in Augusta to join in on the fun. Palm Village does over-the-phone orders all the time, so if you happen to be the winner, simply call in and have your Lilly sent to you. I'm so excited! I hope y'all have the best Wednesday :) Thanks for stopping by!